For the waffles - whisk together the egg, milk or water, Chocolate Chip Pancake & Waffle Mix and butter until uniformly blended. 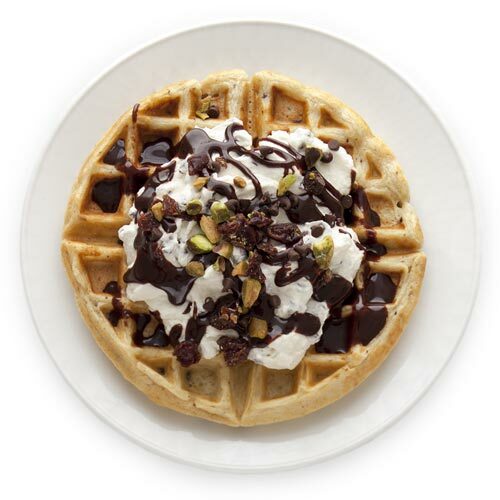 Cook waffle batter in a preheated nonstick or greased waffle maker until golden brown. Allow waffles to cool on a rack until ready to use. Mix the ricotta, mascarpone, confectioner's sugar and vanilla in a medium bowl until well blended and light and fluffy. In a separate bowl whisk the cream until stiff peaks form. Fold the ricotta mixture and chocolate chips into the whipped cream. Warm the chocolate sauce 15-30 seconds in the microwave until it is pourable, but not hot. For the nut topping combine the pistachios, cherries and mini chocolate chips in a bowl and mix. Place waffles on serving plates. Divide the cannoli topping on each waffle. Drizzle each with chocolate sauce and sprinkle nut topping over the top. Serve immediately.